The huge and unprecedented $110 billion (£53.7 billion) injection into money markets by the world's key central banks yesterday has been greeted with skepticism by the financial markets with Asian and European stock markets selling off aggressively today. 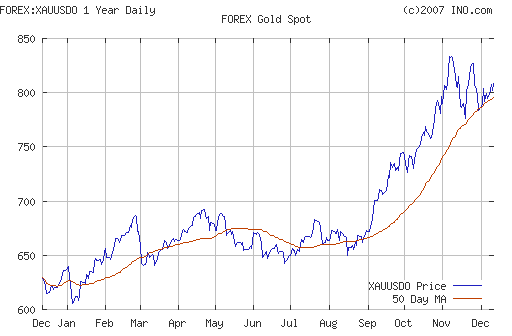 The drastic central bank action will lead to heightened risk aversion and safe haven demand for gold. The world's financial and monetary system looks increasingly like a very unattractive base metal. Central bankers are not alchemists who can create gold out of base metal. The financial system is so unbalanced due to humunguous and unprecedented credit creation by western central banks and the Federal Reserve in particular. Unfortunately no amount of liquidity can alleviate the problem. In fact releasing the helicopters and injecting billions of dollars of liquidity into the system while alleviating the situation in the short term will likely create even greater difficulties in the long term as the markets begin to be concerned regarding sharply increasing moral hazard, the diminishing value of fiat currencies and the possibility of a global monetary crisis. Alan Greenspan and his era in the Federal Reserve is in large part responsible for this global financial crisis. It is ironic given his much celebrated quote regarding fiat currencies and gold: "Gold still represents the ultimate form of payment in the world. Fiat money in extremis is accepted by nobody. Gold is always accepted." We are now witnessing a huge increase in the money supply and fiat money in extremis. This can only lead to dilution of the existing money supply and further debasement of currencies. Virulent stagflation or a new form of hyperinflation look increasingly likely especially in the light of the changed globalised economy and increased global demand for finite commodities such as wheat, oil, water and gold. There is no 'silver bullet' to magically to solve the huge structural challenges facing western economies and the financial system. While liquidity has been one of the major issues up to now - soon the solvency of major financial institutions will become the issue and the UK's Northern Rock is now likely the first of at least a few 'run on the banks' in the coming months. This is not alarmist. Suggesting that there could be a run on Northern Rock was not alarmist as it happened. Now more than ever it is important to deal in economic reality. Silver is trading at $14.64/66 at 1200 GMT. Silver rallied on the central bank announcement yesterday and has since gone back to yesterday's price. Platinum was trading at $1477/1482 (1200 GMT). Oil rallied sharply on the central bank news yesterday to above $94 a barrel in US trade yesterday and remains above $94 today.